Breakfast is often a tricky venture when you have guests staying for the weekend. Not everyone rises at the same time and it’s always nice to leave things out for guests to grab at their convenience. While coffee, breads and pastries, along with healthier fare can be left on the counter, I like to leave a pretty but ‘help yourself’ breakfast table setting for weekend guests. The setting should be attractive, yet casual enough for people to feel comfortable moving plates and utensils around. Presenting a cluster of dishes rather than formal place settings will give that feeling, while also leaving space for people to sit at the table to eat. There are certain colors that just say “breakfast” to me. I love how the purity of creamy whites and pale pastels hints at the promise a new morning brings. 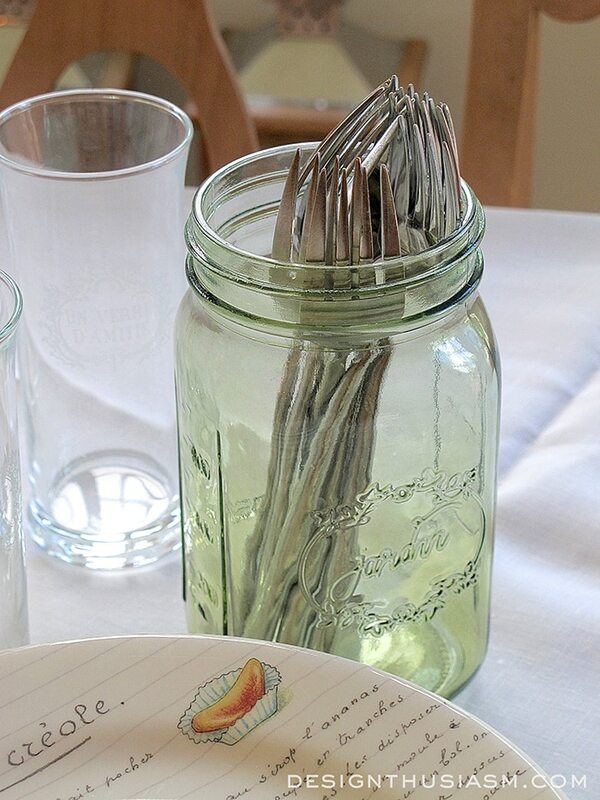 Utensils here are placed in a lovely pale green mason jar. 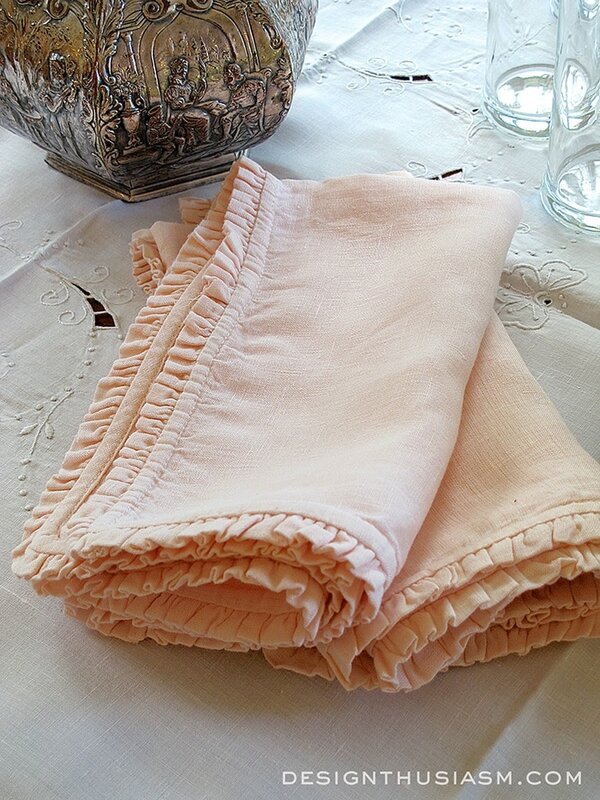 The blush tone linen napkins with ruffled edge are from Pom Pom at Home and exude a homespun warmth. Plate stacks in two sizes allow for large and small appetites. 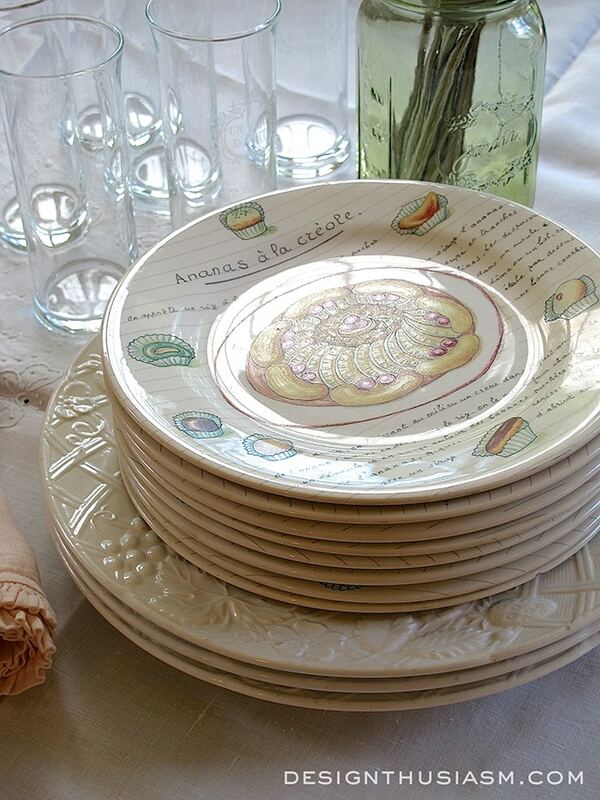 The salad plates are one of my favorite patterns called Desserts Gourmands from Gien France. The ivory dinner plate is English Countryside from Mikasa. 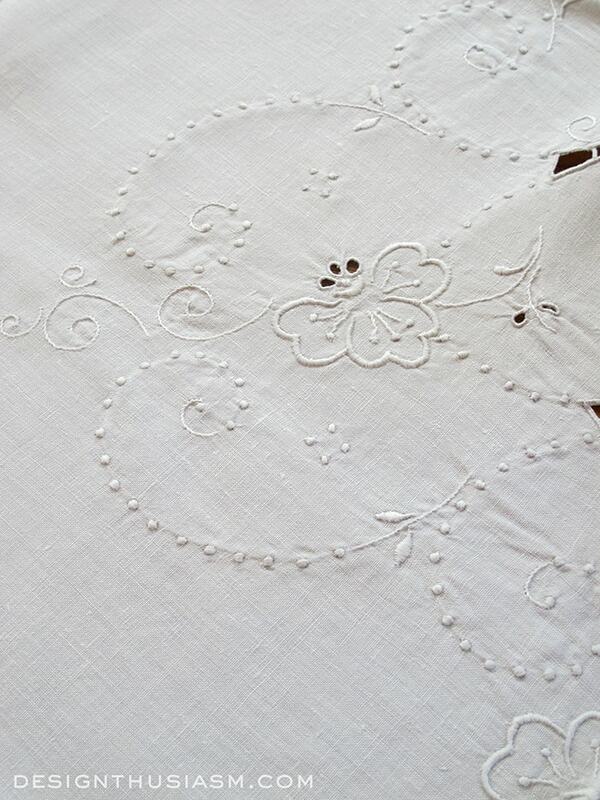 The underpinning is a white vintage tone-on-tone embroidered tablecloth. I rarely worry about the size of my linens and often throw a small cloth on the table, set askew, leaving the wood patina to peek through at the sides. 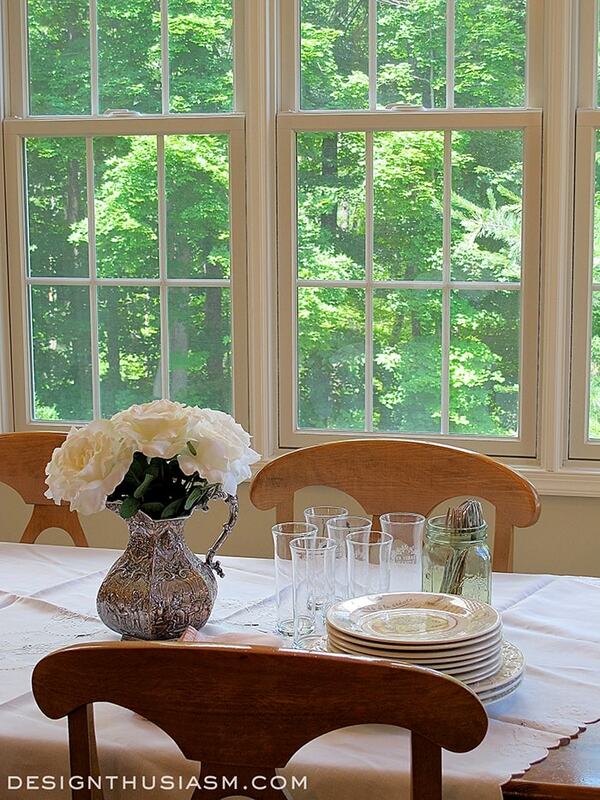 The wall of windows in our breakfast room offers a delightful view of the greenery outside. Glasses for juice mix with the grouping while coffee mugs are placed closer to the coffee maker. I generally cap off my tables with fresh flowers, but in a pinch, these white faux stems in a silver repousse pitcher are a pretty accompaniment. I used a few of these same items in a somewhat more formal lunch setting that you can be on the lookout for in an upcoming post. This is how we like to serve breakfast to guests too. My husband and I like to eat healthy breakfast usually cereal and fruit. It seems like the tendency is for people to serve lots of special foods when there’s company but honestly I’d rather start the day on a light note. When we have company we put out several cereals, fruit, and usually cinnamon rolls. Your table is beautiful and I love the view. Great serving idea…love your attention to detail. 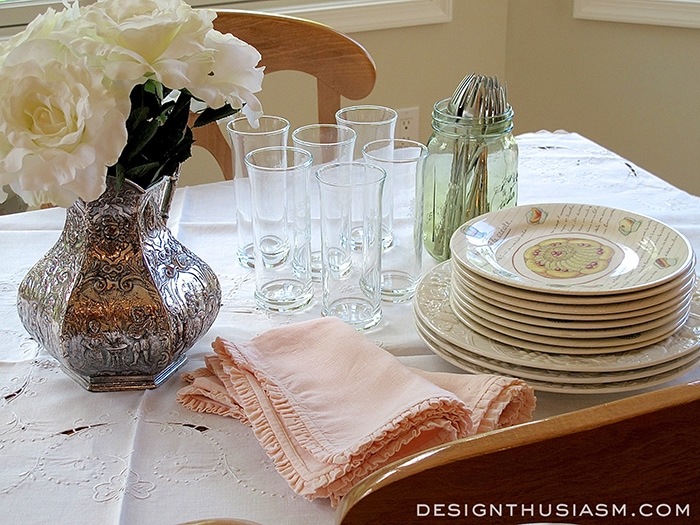 Love those pretty plates and linens! Perfect!!!! I love the subtle color of your plates. I don’t like to be “jarred” (pun intended) by bright colors early in the day! Simply elegant. Ha ha! Thanks, Elizabeth… 🙂 Thanks for visiting! 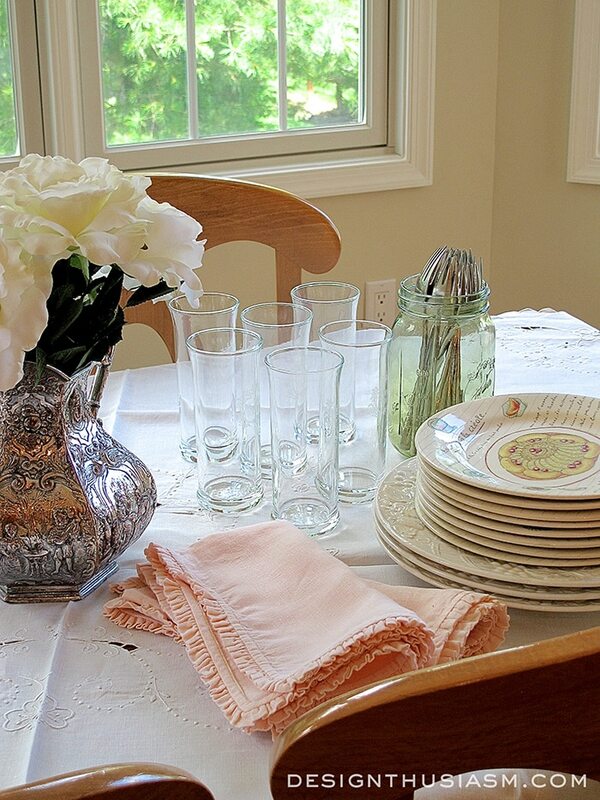 one thing I do different is to place the silverware in the container with the handles up to take hold of by my guests. They have commented how much they appreciate this as the eating surface of the forks, knives, etc. have not been. handled by other people. 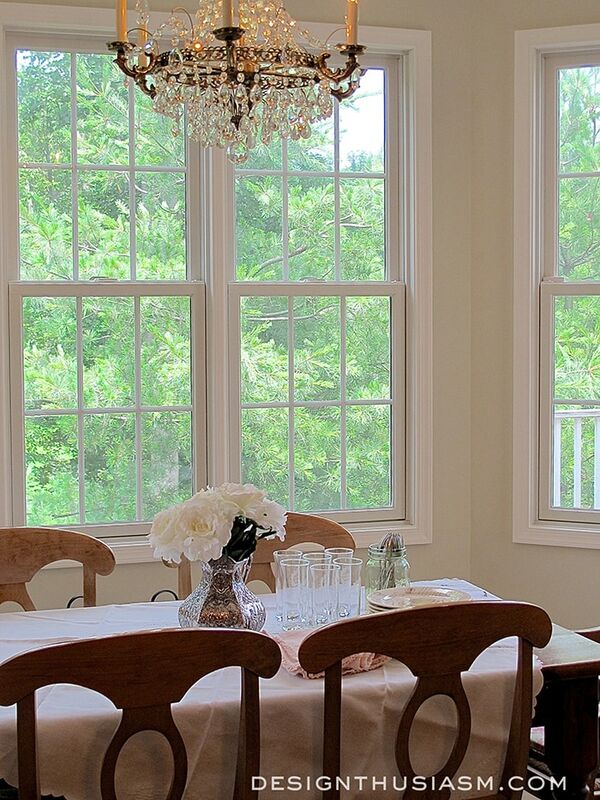 Thank you for all your lovely posts and enjoy the decorating of your new home. Thanks, Sandra! That is such a great point… 🙂 I’ve actually wanted to get new casual flatware, so maybe I’ll look for something with interesting handles for next time. Lori: I love the soft peach of the napkins. They complement the dishes beautifully as well as your lovely tablecloth! I, too, enjoy having company, and love to come up with little touches to make our guests feel welcome. Now, if they would only sleep late! Argh! Most of my friends wake up at the crack of dawn, making it very hard to get a jump start on breakfast! I’ve opted to prepare a main dish like quiche, frittata, or breakfast casserole before the guests arrive and keep it frozen until I’m ready to pop it in the oven. At least, that’s one dish I don’t have to worry about. Your guests are a lucky bunch! What a wonderful way to start the day! Wow, well I’d say your guests are lucky too! I’d be delighted to wake up to a nice frittata… 🙂 Thanks for taking the time to comment! Beautiful display! I love all the colors that you brought together:) Your chandelier is gorgeous! Great idea and I love the pastel colors. Those Desserts Gourmands dishes are really pretty and look perfect with the white Mikasa dishes. The flowers add a nice touch! I did something on this line at the holidays once when the kids were home. It seemed to work out well. Thanks, Liz! I wish I could find more of the Desserts Gourmands. I love them but they’re discontinued. Sometimes I can get a few on ebay… 🙂 Most of my patterned dishes I just use for special occasions, but these I use every day because they make me smile! Thanks for visiting as always! !